Defeat Union-Busting Drive at Long Island University! SEPTEMBER 14 – As Long Island University’s lockout of unionized faculty at its Brooklyn campus enters the second week, the stakes are clear. The unprecedented move by university president Kimberly Cline is a vicious attack not only against the faculty, students and staff at LIU Brooklyn, but against everyone who works in higher education, and on the entire New York-area labor movement. This is a battle for the most basic rights of us all – and the power needed to defeat this union-busting assault must be brought into play before it’s too late. Holding signs reading “Let Us Teach,” the Long Island University Faculty Federation (LIUFF) has been picketing since the lockout was decreed on September 3. This came a week after the Cline administration presented the LIUFF with a “final offer” clearly designed to be rejected. This includes a 25% pay cut for adjuncts to be imposed by reducing the maximum number of credits taught from 12 to 9, while slashing paid office hours for adjuncts and funding used to provide their health insurance. For tenured professors there was the introduction of a “faculty engagement and development” review which could potentially put an end to tenure and faculty autonomy from administration control. Moreover, when this “offer” was presented, it was accompanied by a letter notifying faculty that they were being locked out of the school effective immediately. As an LIU professor noted on the picket line, it says a lot about the contract LIU management is trying to shove down the faculty’s throats if it locked them out before they even had a chance to vote. Meanwhile, LIU management was bringing in scabs, and flaunting this in everybody’s face in true union-busting fashion. It prepared this plan of attack for months beforehand. Bogus curricula were posted online (on Blackboard) over the summer for the “replacement teachers” to learn. But where did these curricula come from when the real professors who would have taught these classes had no access to any LIU resources? The administration. This amounts to corporate-style skills training – not education – to be spoon-fed by scabs to LIU students paying $34,352/year. 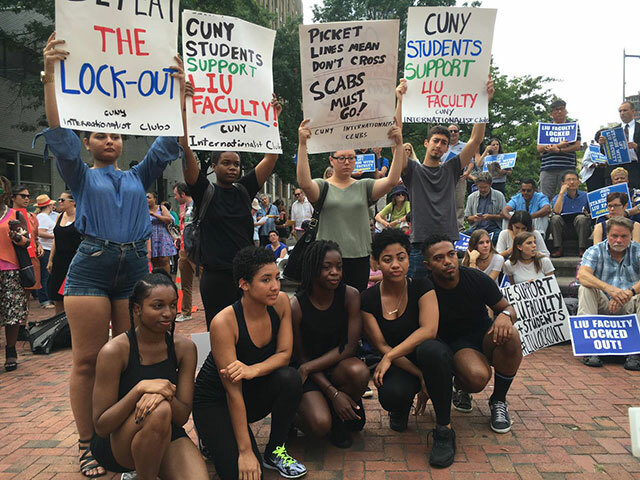 LIU’s scab-herding has aroused considerable outrage, as even the New York Times reported that a ballet class was to be taught by a dean who is – a botanist. The Times quoted the LIU lawyer saying such “errors” had been “corrected” and that courses would be taught by “qualified” instructors. But students reported that another scab “teacher” was so clueless she almost got ballet students injured. The union responded to the “final offer” with a request to extend the prior contract for five weeks. The administration countered by essentially saying “no way” – pretty much the equivalent of the famous 1975 Daily News headline, “Ford to City: Drop Dead.” Yet at a teach-in sponsored by the LIUFF on Friday, September 9, the repeated plea was for the administration to go back to the bargaining table. And if the union were to cave in to some variant of the horrific contract “offer,” it would merely be the beginning of the end of the union. Seriously? Like students throughout the U.S., those at LIU have been following the spread of protests like those launched most recently by Colin Kaepernick, against what the rulers of this society and their police “do in America.” As for union-busting, it’s as American as the proverbial apple pie. The flag-waving by Weingarten had a political purpose, as the AFT head (who has long hoped for a spot as Hillary Clinton’s Secretary of Education) kept shouting about “Trumpism.” NYC Public Advocate Letitia James did her bit to make it a virtual Democratic Party campaign event with a pitch about how it was the youth that elected Obama to bring about meaningful change. In contrast, at the teach-in, CUNY Internationalist Clubs activist Jacob emphasized the need to “knock out the lockout,” which means teachers standing strong against the administration and students understanding that so long as the lockout continues, “you do not belong on campus.” Instead, students and faculty should be helping make the picket lines real ones that nobody crosses. Jacob noted that at the City University of New York, teachers and campus workers are subject to the anti-labor Taylor Law, which makes any strike or job action by New York State employees illegal – and that this is enforced by “the Democratic Party of capital.” Breaking from support and subordination to the bosses’ parties is crucial to winning a serious fight like this, he stressed – and to win, the struggle must be extended beyond the borders of the university. The faculty fighting for their jobs and against this blatant union-busting must demand that all the unions at LIU, together with students, respect their picket line. That means that administrative staff, maintenance workers, operating engineers and carpenters should be out there with the locked-out teachers instead of going through the lines. This is the very opposite of claims by one LIUFF spokesman who chided activists that telling students not to cross was “sending the wrong message,” and that the line was meant to be an “informational picket line.” This is a sure recipe for defeat. The university bosses will not be defeated by appeals for “collegiality” or by playing by some academic version of the Marquis of Queensbury rules of yesteryear in the middle of a brutal knock-down, drag-out fight. The administration has flaunted its power to lock out the union – it is power that must be mobilized to defeat them. NYC labor must show up and defend the line. A good place to start would be with phone workers in the huge Verizon building just down the street, who were some of the 39,000 who struck for six and a half weeks this summer. 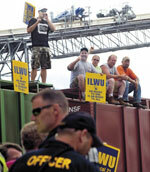 And to hit the administration union-busters hard, the unions should shut down the C.W. Post campus of LIU. Back in May 2015, the faculty union at Post negotiated a three-year contract extension, a year before the contract was due to expire, without notifying the Brooklyn campus union, with which they traditionally negotiate together (both contracts end on the same date). The Brooklyn LIUFF was livid, and rightly so, especially as one of its main demands has been to match pay with that at the Long Island campus. Evidently the faculty at Post are beginning to see that the administration’s divide-and-conquer tactics mean that they’re next on the hit list, as they just passed a motion of no confidence in Cline. But to actually win this battle, students and faculty should shut down not only the Brooklyn campus but also the Post campus – and the bosses’ rules be damned! In this key battle, faculty, staff and students at LIUFF must unite and appeal to all NYC labor. On Labor Day, the United Federation of Teachers, representing 150,000 NYC teachers and paras, marched with signs saying “UFT Stands With LIU Faculty.” So instead of the UFT tops’ empty words, the Brooklyn campus should be ringed and the doorways jammed with hundreds of UFTers! Bring in the retirees on the morning shift and in-service teachers can spell them after class lets out in the afternoon. The same goes for the Professional Staff Congress at CUNY. And NYC-area students should come too, for an extra-curricular lesson in class struggle! The haughty would-be dictators running LIU have shown as clearly as could be that “common ground” with the bosses is a dangerous fantasy. Nor can any “mediator” bring about some kind of amicable arrangement with those pushing to bust the union. Weingarten’s song and dance for Hillary shows the acute danger that the struggle at LIU may be yet another one sacrificed on the altar of support to the Democratic Party of police repression, imperialism and war.